What anatomically distinguishes Neanderthals from modern humans? Turns out a great place to start is with teeth. This article by expert in Maltese prehistory, Anton Mifsud, integrates twenty-first century scientific methodology, namely Biological Anthropology’s ‘Geometric Morphometrics’, into the existing traditional historiography on ancient Malta, by means of teeth. Mifsud explores the evidence pertaining to human presence in Malta long before mainstream archaeology’s accepted chronology, and the extent to which defenders of this knowledge-monopolising Victorian tradition have sought to conceal it. The implications of these findings are revolutionary. Three unusually shaped human molars were discovered in the deeper layers of a large cavern on the Southeast of Malta, two in 1917 (Despott 1918), and a third in 1936 (MAR 1936). These molars are known as ‘taurodont’ or ‘bull-teeth,’ they are peculiar to very ancient human beings such as Neanderthal Man, and I have named the owner/s of these molars the Dulam Cave Man/Men. (Above) The Maltese Islands with the sites containing fossil remains of Ice Age mammals, including man; Ghar Dalam is shown in the Southeast of Malta. 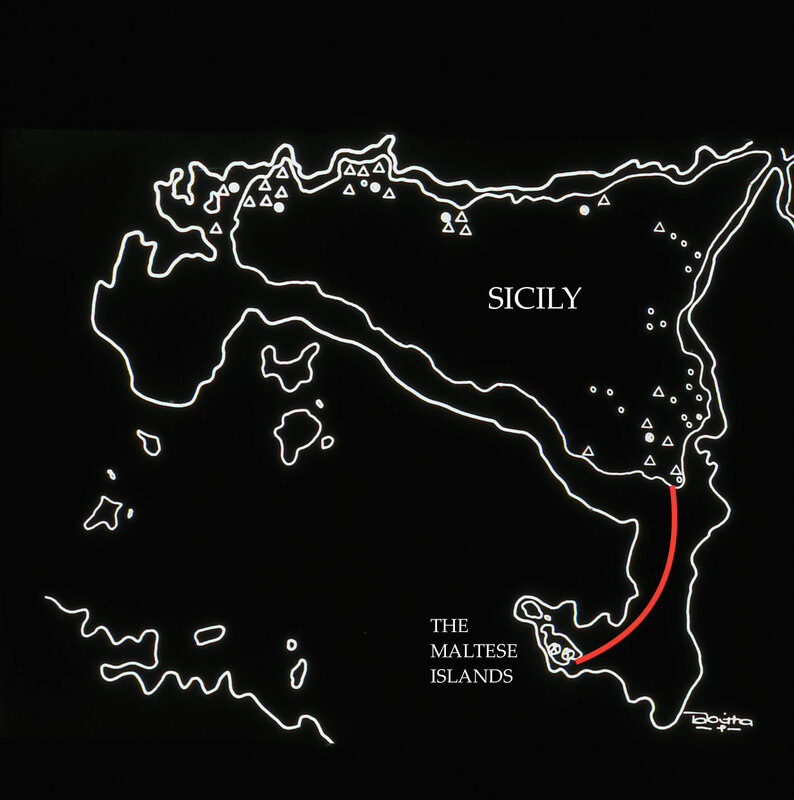 (Below) The land bridge connecting Sicily to the Maltese Islands during the Ice Age, and the route taken by the mammals migrating southward, shown in red. The cavern they were found in was originally known as the Ghar Dulam (the Cavern of the Elephants), but has in recent times been corrupted to Ghar Dalam, and incorrectly translated into ‘the Cave of Darkness.’ Likewise for the valley below the cavern, the Wied Dulam – this has been corrupted to Wied Dalam. However, for the sake of uniformity in terminology, the modern names of ‘Ghar Dalam’ and ‘Wied Dalam’ will henceforth be used throughout the script. 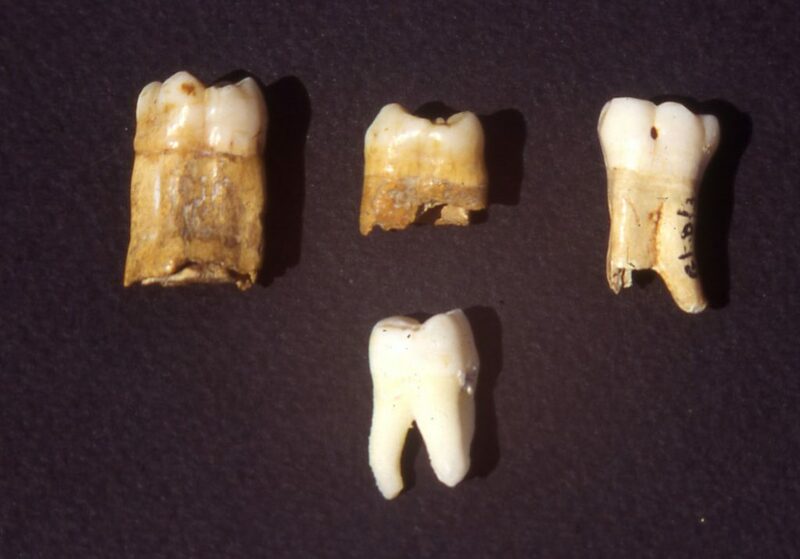 The first two molars that were discovered in 1917 were found seven feet apart in a flood deposit of red earth that incorporated fossil remains of Red Deer and that contained no pottery – this was an Ice Age, or Pleistocene deposit; it is possible that these two molars derived from the same individual. 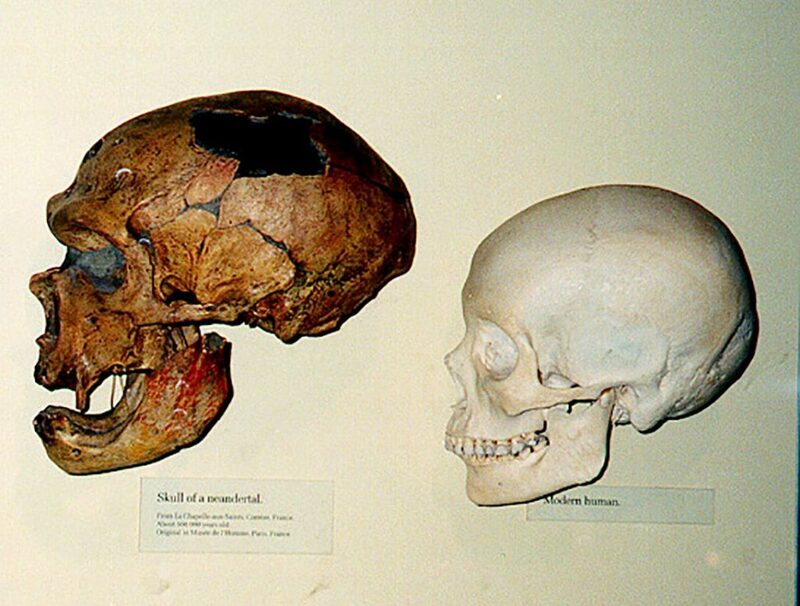 In 1918 and 1924, the renowned anatomist-anthropologist of the time, Sir Arthur Keith attributed these two molars to Neanderthal Man on the basis of their taurodont shape (Keith 1918, 1924); he was thus extending the human presence on the Maltese Islands backward in time by several tens of millennia. The existence of Neanderthal Man on Malta was an accepted fact for four decades; my history book at school was still acknowledging a Neanderthal presence in Malta. In 1964 the taurodont molars were rejected, and were assigned a Neolithic date on the basis of some Nitrogen tests that were carried out at Oxford in 1952 and 1955, through the intervention of Kenneth Page Oakley of the Natural History Museum of London (MAR 1964). 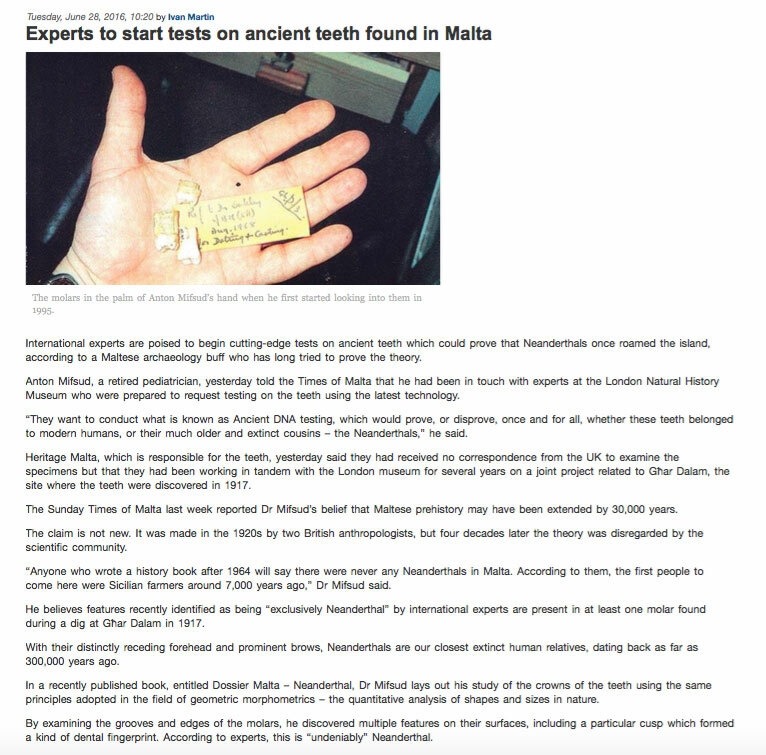 After a period of research in Malta and the United Kingdom, I attempted to rectify the situation in 1997 through the publication, co-authored with my son Simon, of Dossier Malta – Evidence for the Magdalenian, where the Nitrogen tests that were utilized to attribute the 1917 molars to the Neolithic period were shown to be invalid. Evidence for the presence of Late Palaeolithic rock art was also presented by way of further evidence for a pre-Neolithic human presence on the Maltese Islands. This publication was severely criticised by some members of the local archaeological establishment, though with one notable exception, that of the Head of Archaeology at the time, Professor Anthony Frendo, who wrote the Foreword to Dossier Malta, and who defended our hypothesis two years later in Facets of Maltese Prehistory (1999). Notwithstanding, today’s ‘Maltese history’ books still identify the magic date of 5,300 B.C. as the start of the human occupation of the Maltese Islands. 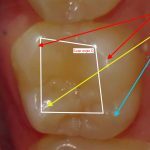 Over the past two decades my on-going research has acquainted me with a new discipline in Biological Anthropology – Geometric Morphometrics of the hominin dentition. At one point, advances in this field had reached a stage when it was possible to diagnose a fossil human from one, single tooth. There was a collection of certain features on the crown surface of Neanderthal teeth that was characteristic of and exclusive to Neanderthal Man. Interestingly, this group of features was absent in anatomically modern humans. 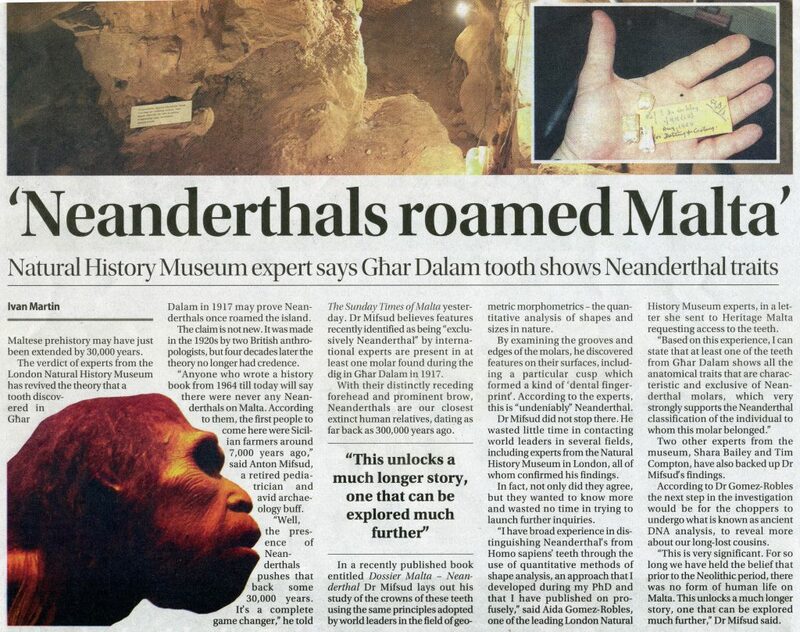 I looked out for these features in the three Ghar Dalam taurodonts, and in early February of this year (2016) I discovered that all the criteria for diagnosing Neanderthal Man were being met with in one of the 1917 molars, namely GhD/1, the first molar that was discovered by Rizzo. The exercise was repeated several times and a positive result was the constant outcome. After some initial hesitation, I referred my findings to the very top, to the expert biological experts themselves, and I solicited their opinion as to whether I was right or not about GhD/1 – it was confirmed as a right upper Neanderthal molar at first glance, and after a further period of a few days for a detailed and total assessment, the present author’s findings were confirmed. I had also consulted with Chris Stringer of the Natural History Museum of London, as a leading authority on Neanderthal Man. But he was initially sceptical about my findings and so he referred me to his colleague expert in the field of Geometric Morphometrics, Tim Compton. When the latter confirmed the Neanderthal features, the both of them convinced me to go for aDNA testing. A fuller investigation including an excavation of the Ghar Dalam cavern has also been proposed in order to confirm a more extended presence on Malta during the Ice Age, beyond that of the Neanderthals. 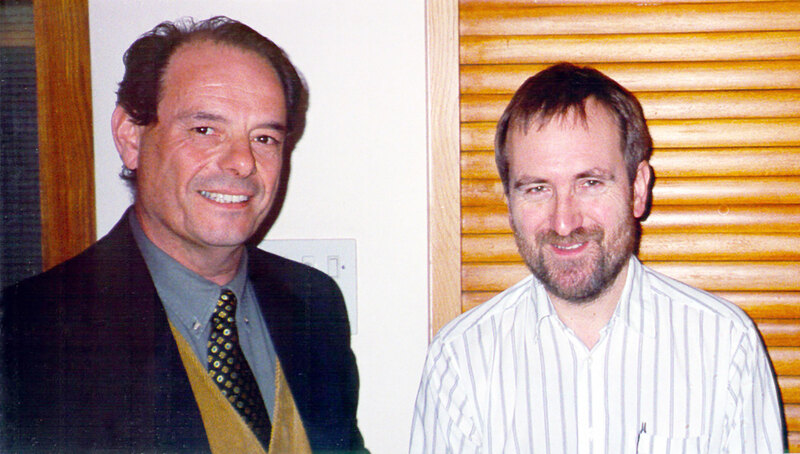 Professor Chris Stringer on the right, main speaker at the January 1998 meeting in Oxford on Neanderthal Man. Stringer was consulted about this Neanderthal presence in Malta, and on its equivalent latitude in Gorham’s Cave in Gibraltar, where he had been excavating when we first met in 1994. During the Ice Ages, the polar caps absorbed considerable volumes of seawater in the form of ice, and sea levels diminished significantly worldwide. The strait between Sicily and Malta was no more and Malta was physically connected with Sicily through a land bridge. The icy weather conditions in the North forced the warmth-loving mammals to migrate southward. In Central Europe they migrated through Italy, Sicily and over to Malta across the land bridge. The larger mammals included elephant, hippopotamus and red deer – and they also included human beings. The areas in the Southeast of Malta were the first to be reached, and this region includes the Wied Dalam and two large caverns – the Ghar Dalam and the Ghar Hasan. At the latter site, Palaeolithic hunter-gatherers left us their rock art images covered beneath stalagmitic sheets of calcium carbonate. At the former site they lived and died, and also left us some of their rock art forms. The other mammals lived and died on the Maltese islands. Their remains were carried by floodwaters into the Pleistocene sites that are with us today, and these include the Wied Dalam. The first home for the Ice Age Maltese was most likely the Ghar Dalam. This was the region of the Maltese Islands to have been reached from Sicily across the land bridge of the Ice Age. 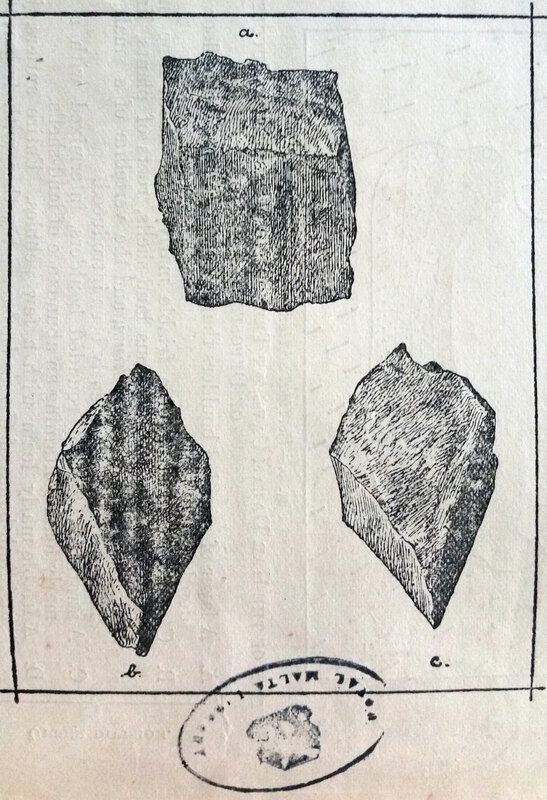 Outside of the Ghar Dalam there were two important discoveries of ancient tools in the nineteenth century that, in the academic climate prevailing at the time, ended up either being lost or discarded. The son of an authority in Palaeolithic tools, John Hookham Frere came to Malta in 1820 and built his villa overlooking the Msida Bay. After discovering an ancient implement in the garden, he consulted Dr John Davy, the brother of the renowned chemist, Humphry Davy. Dr. John Davy confirmed the genuineness of the implement discovered by Frere. 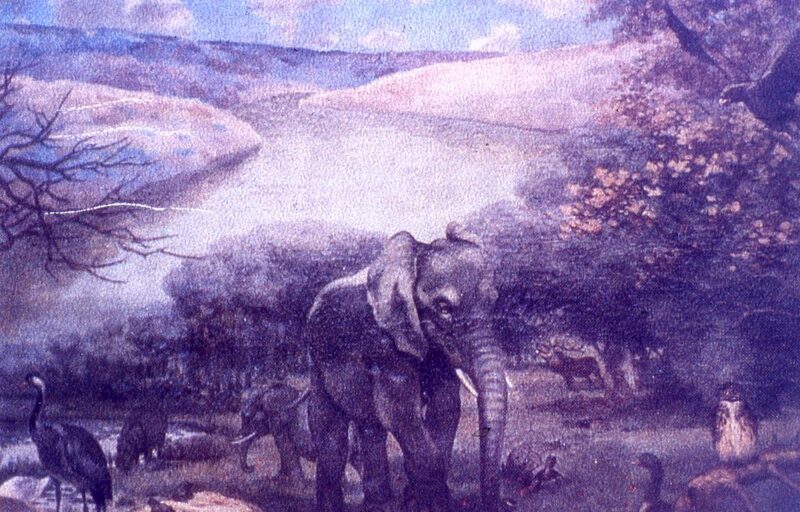 In the company of Captain Swann, Dr. Andrew Leith Adams discarded the implement that he had discovered amongst fossil elephant remains at Benghajsa Gap, a Pleistocene site in the vicinity of the Dalam and Hasan caverns in the southeast of Malta. Apart from these two discoveries that were later mentioned by Caton Thompson (1925: 10), there were another two that were made inside the Ghar Dalam itself. 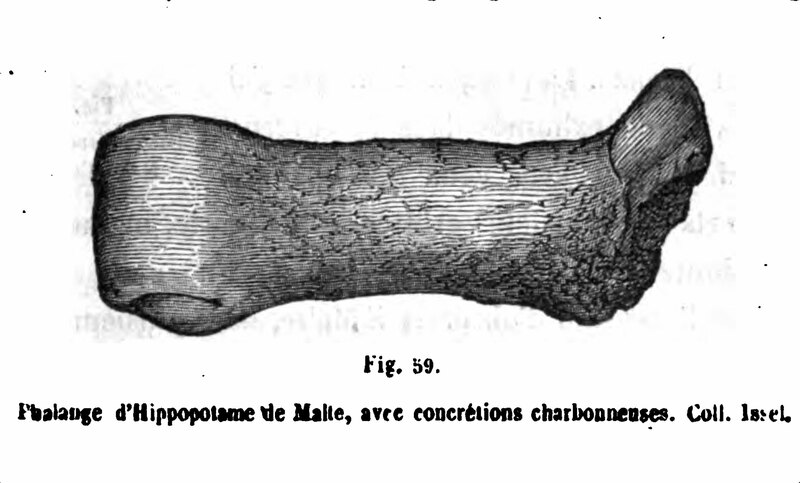 In 1865, Professor Arturo Issel made the remarkable discovery of the remains of hippopotamus (see figure below) and other mammals that were carbonized. Humans inside the cavern had actually cooked and eaten hippopotamus meat, and had then split the bones open to extract the marrow for consumption. Towards the end of the nineteenth century, the crudely worked implement discovered by John H. Cooke provided further evidence for the presence of humans on Malta before the traditionally accepted date in the Neolithic. Thomas Ashby was Director of the BSR in 1906. From 1908 until the start of hostilities in 1914, he trained a small number of Maltese scholars in the latest field excavation methods of the time – the Curator Giuseppe Despott, the Mechanical Engineer Carmelo Rizzo, the Mathematician Napoleon Tagliaferro, and the medical doctor Themistocles Zammit. Ashby also participated in the first digs in Ghar Dalam together with these Maltese trainees in early twentieth century archaeology. By 1912 Tagliaferro and Rizzo were sufficiently trained to dig on their own steam and they excavated two trenches in Ghar Dalam. Two years later Ashby conducted further excavations in the cave together with Zammit, Despott and Tagliaferro. Then in 1916 Despott started on a series of excavations that were to yield ground breaking results. The major discovery came about in the summer of 1917, when Giuseppe Despott and his colleague, Carmelo Rizzo discovered the two taurodont molars in the so-called Trench II. 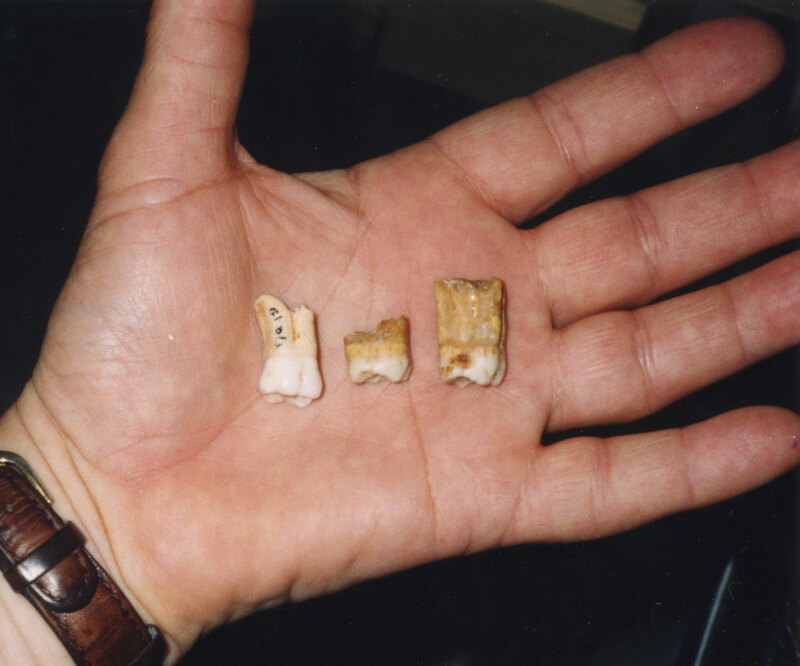 The three ‘bull-teeth’ or taurodont molars at the top at the start of the investigation in 1994; they contrast significantly with a modern tooth below, in size, shape and coloration; their crown surfaces are also evidently different. See below. Contrary to what has been insinuated in recent years (Bonanno 2001a: 146-148; 2001b: 16), Zammit fully endorsed the presence of Palaeolithic Man on Malta in his publications, even citing his own discovery of microliths as further evidence for this Palaeolithic presence (1926: 30-2); Zammit confirmed this presence further in his Prehistoric Remains of the Maltese Islands (1930: 4). 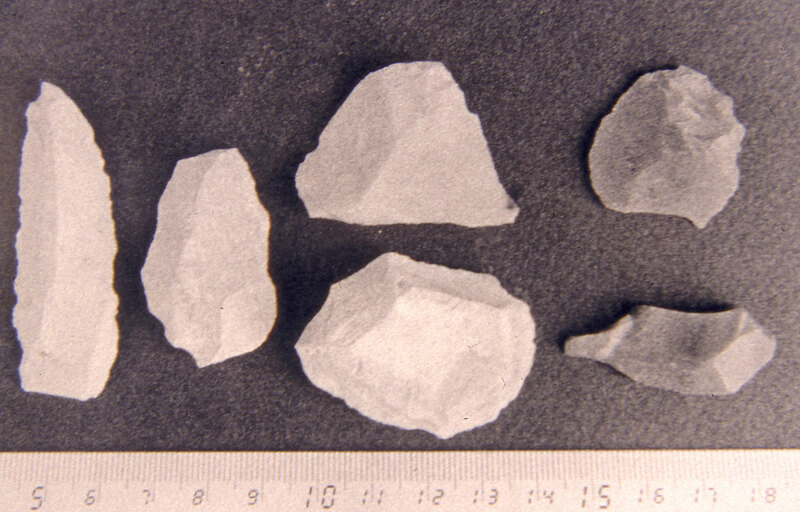 A few of the microlith tools discovered in Ghar Dalam; this type of stone tool was characteristic of the pre-Neolithic period. Faithful to the BSR’s mission of interdisciplinary exchange, Thomas Ashby the archaeologist handed the matter of the taurodont molars over to the experts in Biological Anthropology. He liaised and consulted with Arthur Keith, the anatomist-anthropologist par excellance of the day. Arthur Keith identified the extreme taurodontism in the Ghar Dalam molars as identical to that of Neanderthal Man discovered in other sites, such as at Krapina, Croatia and at St. Brelade in Jersey. 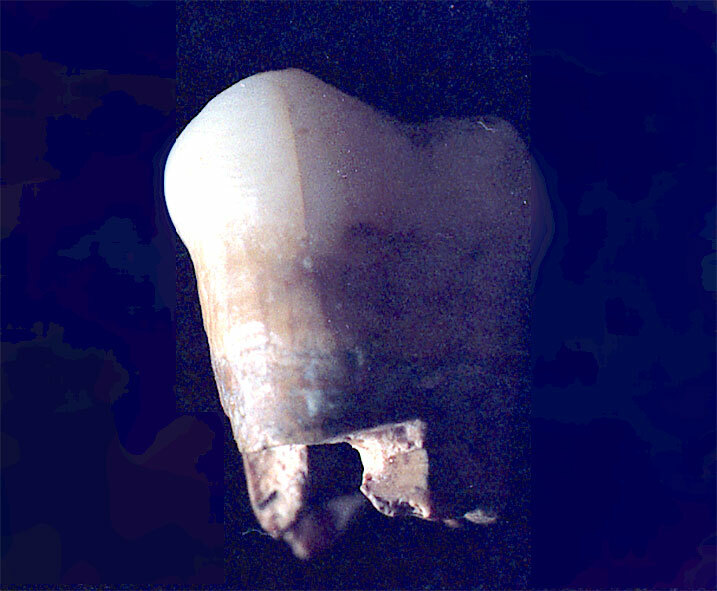 In an attempt to exclude the possibility that the condition of taurodontism was a dental feature that was peculiar to the Neolithic Maltese, Keith examined 2,250 teeth from a Neolithic site (Burmeghez) – there was not one single occurrence of taurodontism in these teeth, as was later on also confirmed by the ethnologist L. H. Dudley Buxton and later still by the Director of Museums, Dr J. G. Baldacchino. Keith first announced the discovery of Neanderthal Man in Malta in his letter to Nature of the 25th July 1918. He identified Rizzo’s molar as a first upper molar, and that it lay in the same horizon as Red Deer of the Ice Age; other artefacts in the same horizon were a flint scraper, obsidian scrapers and a chert knife. By 1922 Despott was in the international limelight for his discovery of Neanderthal Man in Malta. And in 1924 Keith published ‘Neanderthal Man in Malta’ in the proceedings of the Journal of the Royal Anthropological Institute. Arthur Keith included a figure by S. A. Sewell to illustrate the features of the taurodont molars from all views. 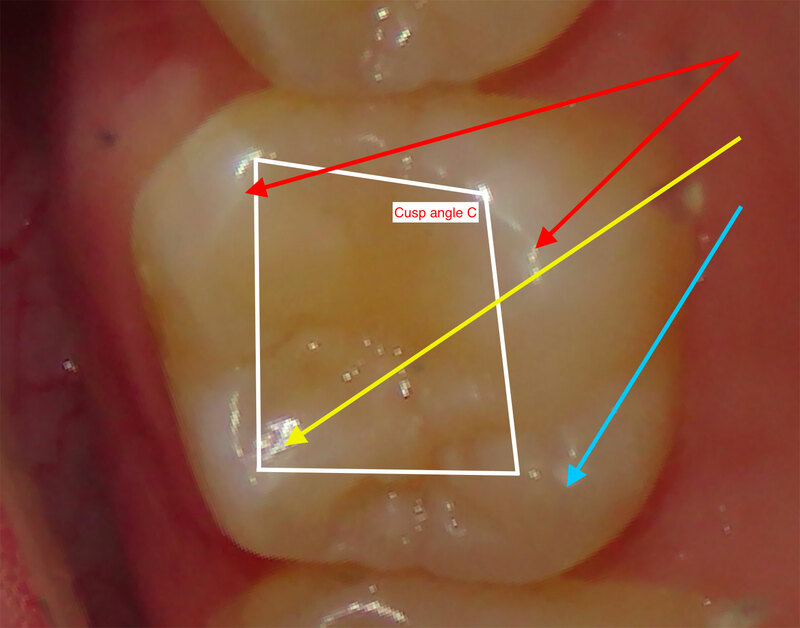 The geometric morphometric features on the crown of Rizzo’s molar were there for all to see, but the discipline was still at its very beginning. It would take more than nine decades before the advances in the field made the identification of Neanderthal Man a distinct possibility. The presence of Neanderthal Man in Malta was accepted for four decades in Malta and overseas. 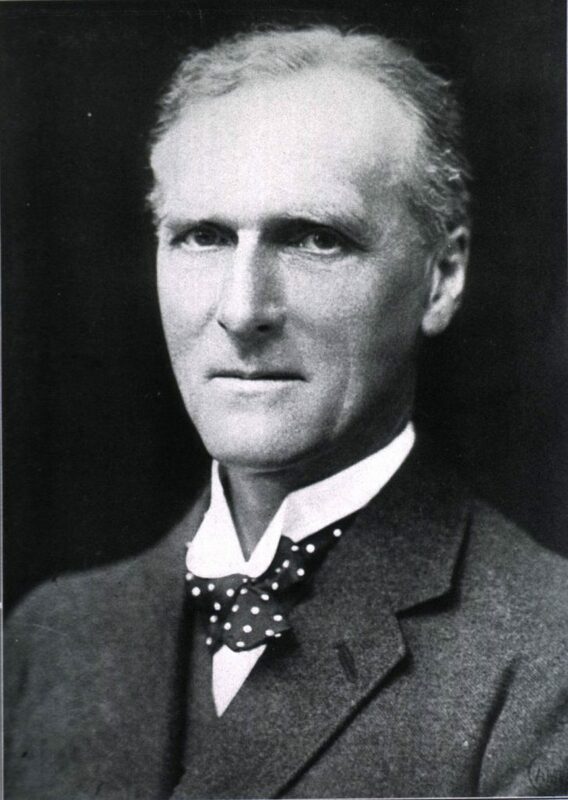 In the meantime, the geologist-palaeontologist Kenneth Page Oakley at the Museum of Natural History in London (henceforth the NHML) had devised a series of chemical tests that confirmed or refuted whether archaeological finds lay in the same stratigraphic layer, or ‘horizon’ in archaeology jargon. In the early 1950s these chemical tests had been used to prove the fabrication of the Piltdown remains (then representing the oldest human remains in England). The archaeological forgery of the century was exposed through these Relative Dating Tests devised by Oakley. These were the Fluorine, Nitrogen and Uranium Oxide. These tests started to be applied to other human remains world wide, and the results of the hundreds of these tests are still to be found in the ‘Green Book’ at the NHML. These chemical, or Relative Dating tests were carried out on the Maltese taurodonts between 1952 and 1968. Although it has been stated in 2001 that these dates had then long been obsolete (Underworld 403), Colin Renfrew’s standard textbook of Archaeology with Paul Bahn was still endorsing, in 2004, Oakley’s chemical dating tests as useful tools in confirming or refuting the presence of organic remains in the same horizon (Renfrew and Bahn 2004: 123-4). During the 1950s the Maltese taurodonts attracted the attention of Oakley. This was during the ‘Prehistoric Survey of the Maltese Islands’ that was being carried out by the British archaeologist, John Davies Evans. In November 1951 Oakley asked the Malta Museum for a sample of dentine from the taurodonts, and initially he was planning the Fluorine test as the most useful method to confirm their archaeological context. The taurodont molars were put to the test – was their archaeological context as described by Giuseppe Despott correct? The proper series of tests at the time to settle this issue were the Relative Dating Tests adapted and designed by Oakley. Two series of Fluorine tests were carried out in 1952 at the NHM in London and these confirmed that Despott’s molar had the highest Fluorine reading – that made it the most ancient specimen amongst the four tested. The other three were a Neolithic tooth, a sample of Red Deer and another of Hippopotamus. The Fluorine tests confirmed that the taurodont molar was at least contemporaneous with Red Deer. Yet notwithstanding these unambiguous results of the Fluorine test, the interpretation was refuted by John Evans, who in an article in the Malta Year Book of 1954 declared that Dr Baldacchino ‘had proved’ that the taurodont teeth belonged to a period later than the Palaeolithic. After an interval of three years, Oakley asked the Malta Museum for another sample from the taurodonts, this time for Nitrogen analysis. The result of 1.85 was out on the 17th of June 1955, and yet it was transmitted to Malta seven years later, on the 3rd of December 1962. The unreliability of the Nitrogen test has been confirmed by Ms Louise Humphrey at the NHML – it definitely contradicted the radiocarbon test on Ma. 6, that was carried out by the present author (Hancock 2002: 404). In the meantime, whilst John Evans was creating the prehistoric sequence of the Maltese Islands, a large number of teeth (2,250) from the Burmeghez site in Malta were sent over to the NHM in London. These teeth had been thoroughly examined by Arthur Keith, Dudley Buxton and by the Museum Director Dr. Baldacchino, and all agreed that there was not one single tooth with taurodontism amongst the whole lot. The present author examined them all in 1996 at the NHM in London and can confirm this. According to David Trump (Hancock 2002: 390), when discussing the results of the Relative Dating Tests on the taurodont (GhD/2) with Oakley, the latter commented that the first set of results (the Fluorine test) had shown that the taurodonts were contemporary with Red Deer; yet the second set of tests (Nitrogen) showed that the taurodonts were not older than the Neolithic – however, recent research has revealed that the Nitrogen test was carried out on GhD/3, the one discovered later in 1936, and not on any of the two 1917 taurodonts. In fact, in 1967 the uranium oxide test on GhD/2 confirmed the Fluorine test of 1952 on GhD2 – the 1917 taurodonts were at least contemporaneous with Red Deer of the Ice Age. Then in 1962 Professor J. J. Mangion published an article on ‘Taurodontism in Modern Human Jaws’. Dr. Baldacchino sent a copy of this to Oakley. But even Keith had known all about it, and had even mentioned the occurrence of taurodontism in modern man (1924: 253, fn. 1), though this was a far cry from the condition in Neanderthals – it is as simple to differentiate between a modern and a fossil taurodont as it is to distinguish between a nineteen and a ninety year old human. (It had in fact been his junior, George Camilleri who extracted one of the taurodonts, seven years earlier, from a Floriana male. Mangion’s molars have now been lost (pers. comm. Prof. G. Camilleri May 1997)). 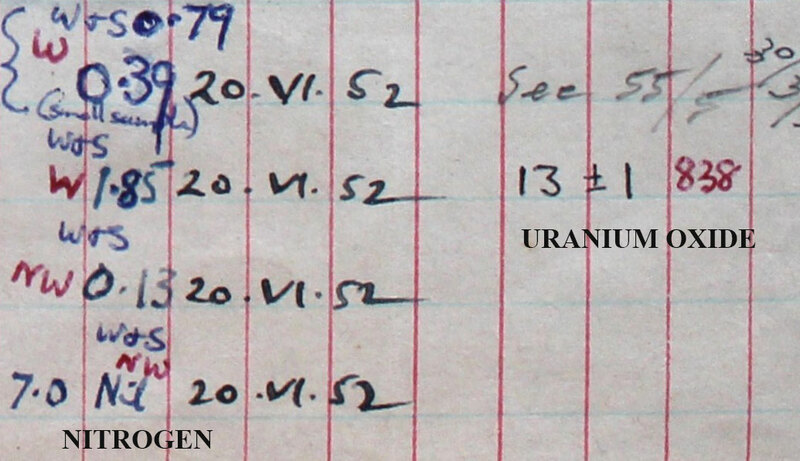 Oakley’s chemical tests on the 1917 molars were finalised in 1967, with the uranium oxide estimation on GhD/2 yielding the value of 13 ppm, making it the most ancient specimen of the lot that was tested, and also confirming its Fluorine tests of 1952. Both these tests had confirmed it as contemporaneous at least with Red Deer of the Ice Age. GhD/2 has just one dentine scar, dated to the 3rd of March 1952, when the Curator Capt. Zammit sawed off a fragment 4 by 2mm for the Fluorine test (pers. comm. Capt. Charles Zammit 31 May 1997). In 1967 it was tested for Uranium Oxide – this test does not require sampling. The Nitrogen test was never carried out on it, and yet it was the ‘Nitrogen test’ that assigned it to the Neolithic period. There are no scars on GhD/1. None of the 1917 taurodont molars was tested for Nitrogen, the very same test that was used to disqualify them. No Nitrogen analysis had been carried out, neither on GhD/1 nor on GhD/2, and yet the ‘Scientific Reports’ published in 1964 selected the ‘non-existent’ Nitrogen test to exclude the Palaeolithic dating for the 1917 taurodont molars. In 1968 John Evans had this to say about the taurodonts, “Some human teeth … which exhibit an abnormality which is fairly characteristic of those of Neanderthal Man, seemed to suggest a presence of a group of Palaeolithic hunters, until it was realised that the later prehistoric population of Malta had teeth which also exhibited this abnormality very frequently” (Rossiter 1968: 10). 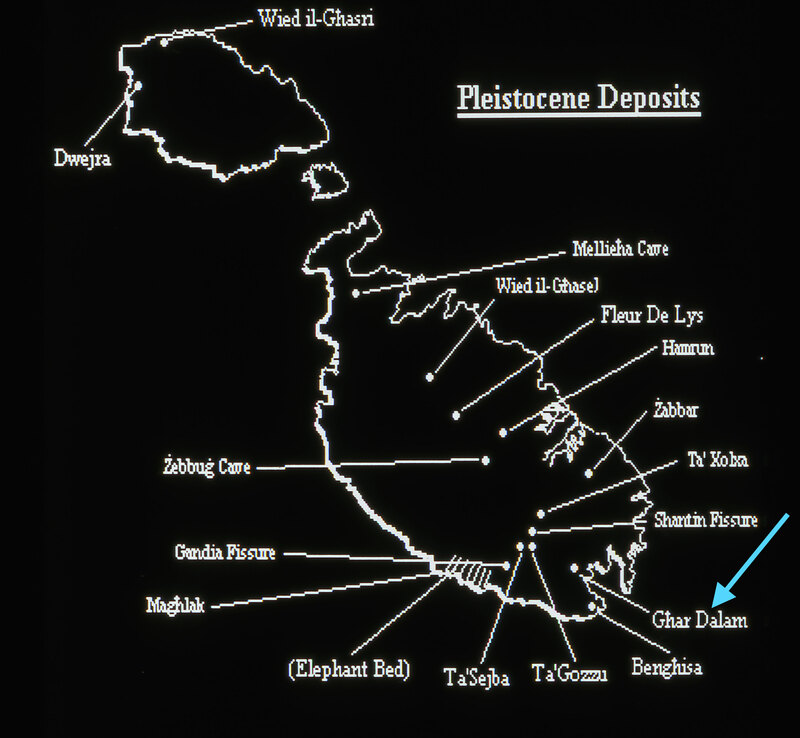 Then in 1971, in his Prehistoric Antiquities of the Maltese Islands, Evans persisted in distorting the facts on taurodontism in Malta by repeating the error that the condition was akin to fused roots, that the former was commonly found in Neolithic Maltese, and that the Ghar Dalam Curator, Dr. Baldacchino had discovered it in some of the Hypogeum teeth. He was mistaken on all counts. But Neanderthal Man had thus been totally erased from Malta’s prehistory. Frequent medical escorts to the Hospital for Sick Children in London during the 1990s provided the present author with sufficient periods of time to visit the Museum of Natural History in Cromwell Road. This was where the chemical tests had been organised and recorded during the 1950s and 1960s. All the research that was carried out there during 1994-1998 was in the office of Robert Kruszynski, next door to that of Chris Stringer. At the time, Stringer was still conducting excavations at Gorham’s cave in Gibraltar and radiocarbon dates were still coming in from Oxford; these dates were demonstrating that Neanderthals survived for longer periods at that latitude. The Dalam cavern in Malta is more or less at the same latitude, one degree further south. 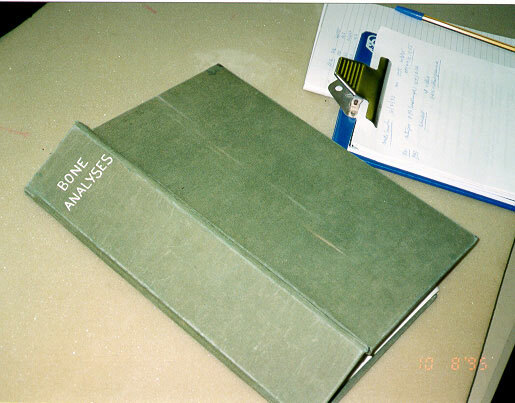 In the Palaeontology Department of the Museum of Natural History, in London, there is a ‘Green Book’ with the ‘Bone Analyses’ that contains all the results of the Relative Dating Tests, namely the Nitrogen, Fluorine and Uranium Oxide that were carried out by Oakley. Folio 105 of the Green Book contains the first results of the ‘Malta Samples.’ The pages are not numbered, and folio 105 is merely the 105th page that was photocopied for me by Robert Kruszynski in 1995. The human remains from Burmeghez were still there – several skulls, a few jaws and the 2,250 teeth that had been examined by a number of scholars to exclude the presence of taurodontism amongst Malta’s Neolithic population. In between visits to the NHM in London, I carried out a few videotaped interviews. One of these was with Captain Charles G. Zammit, the son of Sir Themistocles Zammit, and who spent most of his life in the Museum of Archaeology. He provided me with a number of useful photographs that I utilised in this publication. His involvement and experience as Museologist in the Malta Museum of Archaeology is unsurpassed. The crucial pieces of information that he imparted to me that day included, first, that there was only one specimen taken from the 1917 taurodonts and that was on the 3rd of March 1952, “I sawed it off myself, 2 by 4 mm, you can confirm that yourself, only one slice is missing”; secondly, he had not the faintest idea about GhD/3, he had never seen it before, and thirdly, the very faded photograph that had been exhibited a few days previously during a conference as representing Baldacchino’s molar was taken around 1926, well before the discovery of Gh/D3 in 1936. Apart from the human remains there was also the product of Palaeolithic man’s handiwork in the form of rock art. Photographs taken by the internationally well-known prehistoric art expert, Professor Emmanuel Anati inside the Ghar Dalam in 1986, show so-called ‘tectiform’ images that are characteristic art themes of Palaeolithic hunter-gatherers. “There needs to be an archaeological survey in three caves in Malta” was Anati’s urgent suggestion, and all he asked for was a formal invitation from the local archaeological establishment and he would carry it out on his own funds. He was rejected (The Times of Malta, 18th November 1997). Rock art was also discovered by Anati at Ghar Hasan (above), a cave close to Ghar Dalam. The art was preserved beneath a stalagmitic layer; though badly vandalised since Anati’s discovery of them, some of the rock art can still be seen. Anati reproduced them in a manuscript (1989) that is to be found at the Museum of Archaeology in Valletta. 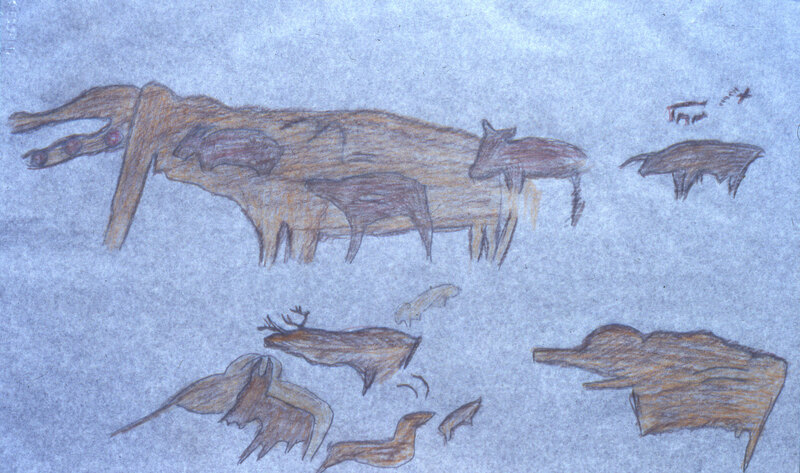 When in 1997 Professor Frendo and I showed the rock art to the prehistoric art expert Enrica Marino from Pinerolo, she unhesitatingly confirmed Anati in his attribution of the art to Palaeolithic hunter-gatherers. But the local archaeological establishment has attributed them to a very fertile imagination (Bonanno 2001: 17). 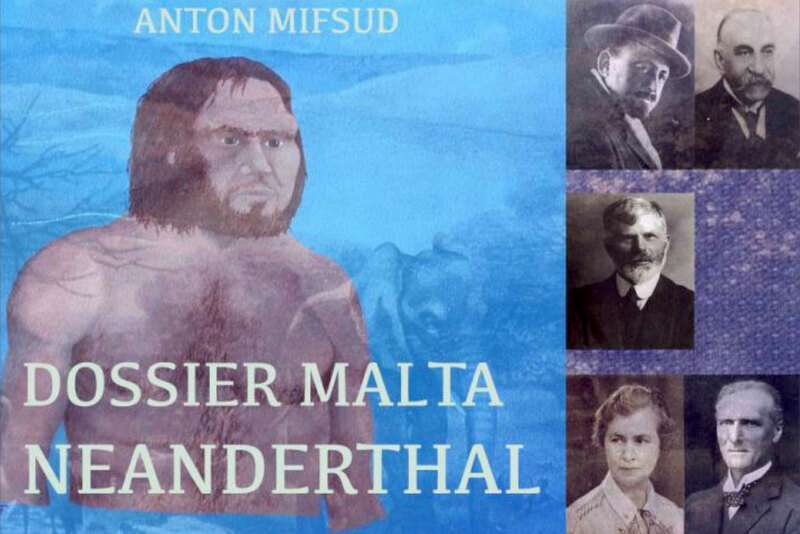 Dossier Malta – Evidence for the Magdalenian was published in 1997. As the chief librarian at the University of Malta put it when I presented him with a copy, I was ‘placing a cat amongst the pigeons’. Dr John Samut-Tagliaferro (Consultant Radiologist and Osteo-archaeologist) reviewed Dossier Malta early on in 1997, and the remainder of the year was spent in a heated, though otherwise very friendly, debate in the local newspapers and in the conference room over the validity of my statements in the publication. In his own publication he made an allowance for pre-Neolithic Man, but was still awaiting more ‘tangible’ evidence (2000: 11). He let me have a look at a manuscript in his possession, written by Dr. Baldacchino in 1963 and that was meant for publication in Scientia, but was refused (pers. comm. G. Zammit Maempel). In this manuscript Baldacchino brought forward his arguments against the 1917 taurodonts being Neanderthal, citing the Nitrogen results and Mangion’s article to back this up. The 1917 fossilised taurodont molars were indicating the presence of fossil hominins, possibly Neanderthal, during the Middle Palaeolithic (200,000-50,000 BP). 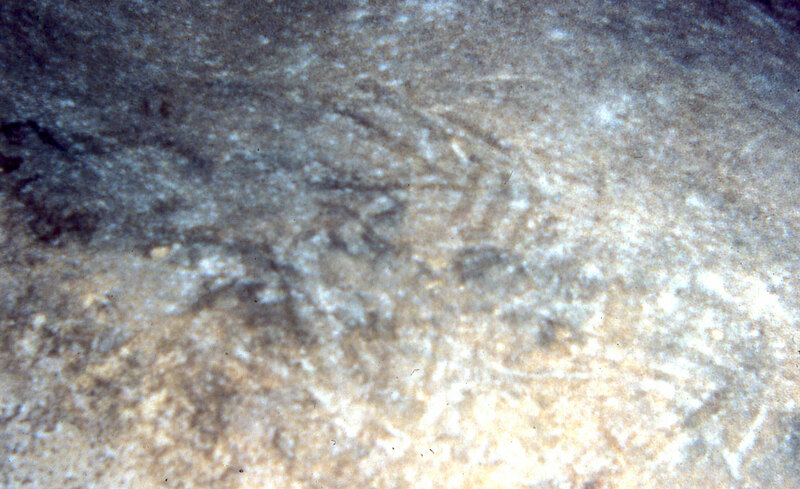 The Palaeolithic art in Ghar Dalam and in Ghar Hasan were indicating a human presence during the Late Palaeolithic (50,000-10,000 BP). A few archaeologists have assumed that the conclusions drawn by the present author were referring solely to a contemporaneous presence of ‘Middle Palaeolithic’ Neanderthals and Late Palaeolithic hunter-gatherers on the Maltese Islands (Bonanno 2001: 17-18). There is no evidence excluding the possibility that both Neanderthals and hunter-gatherers populated the Maltese Islands during different periods of time. There is no evidence contradicting the possibility that in Malta, as in Gorham’s Cave in Gibraltar, Neanderthals (or part Neanderthals) survived into the Late Palaeolithic. The local archaeological establishment acted in a disparaging manner towards Dossier Malta 1997. It accused Arthur Keith of academic recklessness (‘bla thassib ta’ xejn’) in attributing the taurodont molars to Neanderthal Man (Bonanno 2001: 16). It attributed Anati’s prehistoric art in Ghar Hasan to a very fertile imagination (Bonanno 2001: 17). And finally it attempted to ridicule the present author by labelling his hypothesis as a ‘conspiracy theory’, and also by creating a time frame anomaly – assuming that Neanderthals were confined solely to the Middle Palaeolithic, it argued that during the Late Palaeolithic (50,000-10,000BC) there could not have been any Neanderthals around (Bonanno, 2001: 17-18). The message was also conveyed in the display cabinet at the Ghar Dalam Museum. And yet it has long been known that this seemingly anomalous situation prevails in Gorham’s cave in Gibraltar (lat. 36 N), and this site lies more or less in the same latitude as Ghar Dalam (lat. 35 N). The Minister of Culture officially opened the New Museum of Natural History at Ghar Dalam in 2002. One of the displays dealt with the controversy of Neanderthal Man in Malta, starting off with Despott’s and Rizzo’s discoveries of the taurodont molars in 1917, and covering the phases of their acceptance as evidence through Arthur Keith, their rejection after Oakley’s chemical tests, Mangion’s article on modern taurodonts and finally the re-awakening of the controversy through Dossier Malta 1997. Other finds that were displayed included the microlith tools, good monochrome photographs of the molars, colour ones of the stratification columns, and casts of the three taurodont molars. In order to identify a Neanderthal the standard and established method is through anatomical examination of the skeleton. In the unlikely event of meeting up with a live Neanderthal, the prominent features would be a large face with a broad nasal aperture, suggesting that he had a large flattened nose, a stout but chinless jaw and big teeth arranged in a horseshoe-shaped arcade. He was muscular and rather short. The diagnostic part of the skeleton is the skull, which was rather different from that of modern humans. The frontal region was flattened, the brow ridges were more prominent than modern humans, and the occipital region at the very back of the head was expanded into a bun-like swelling. In recent times there has been a particular emphasis on the geometric morphology of the teeth. The molar teeth often have enlarged pulp cavities (taurodontism); he used his teeth as tools and the shape of his taurodont molars served to anchor them well in the jaw as he used them to grind and tear materials such as leather and fur … the incisors were shovel-shaped to a marked degree and were in fact used as such. Other methods include the use of the archaeo-palaeontological context and dating of associated materials; the analysis of ancient DNA using the latest technology is a fast method of confirming further the Neanderthal status. The anatomical features that distinguish Neanderthal Man from modern H. sapiens are not limited to his facial appearance, his skull or the body skeleton in general. 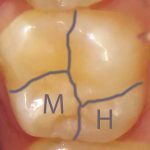 The most recent research has identified characteristic features in his teeth; the incisors are shovel-shaped and the molars are hypertaurodontic; but the micro-anatomical features on the crown are the diagnostic elements. The cusps curve inwards, and there are also other specific relative features in cusp size. At the turn of the third millennium a new discipline in Biological Anthropology was advancing at a rapid pace. Instead of a qualitative assessment of shape, Geometric Morphometrics was being applied to the dentition of fossil hominins as it allowed morphologists to analyse the shape between linear end points quantitatively. The top researchers in the field were consulted, and these included, in alphabetical order, Juan Luis Arsuaga, Shara E. Bailey, Jose Maria Bermudez de Castro, Eudald Carbonell, Timothy Compton, Aida Gomez-Robles, Maria Martinon-Torres, Alejandro Perez-Perez, Leyre Prado-Simon, Rolf Quam and Susana Sarmiento. The pioneer in the field is Professor Shara E. Bailey at the University of New York. Based on the dentition, her doctoral thesis in 2002 supported the ‘Out of Africa’ hypothesis for human origins. 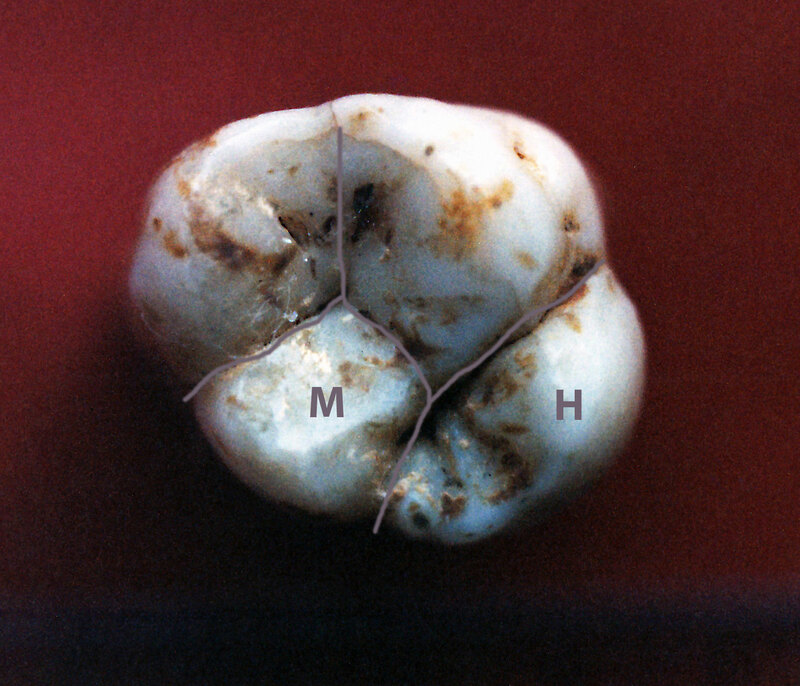 In her 2004 contribution she shifted towards the identification of fossil hominins through their dentition, and in her Beyond Shovel-shaped Incisors in 2006, after examining 745 teeth from a number of sites worldwide (52 non-Neanderthal archaic European, 117 early modern Afro-Asian, 229 early modern European, and 347 Neanderthal), her conclusions on identifying Neanderthals from maxillary, or upper, molars (as is the case for the 1917 Ghar Dalam molars) rested on the following characteristics, namely: hypertaurodontism, an enlarged Hypocone, a reduced Metacone, a skewed outline of the crown, the presence of Carabelli’s cusp, a cusp angle around 120 degrees for the so-called C-angle, and a small ratio of occlusal polygon to crown outline in the order of approximately 26.8%. 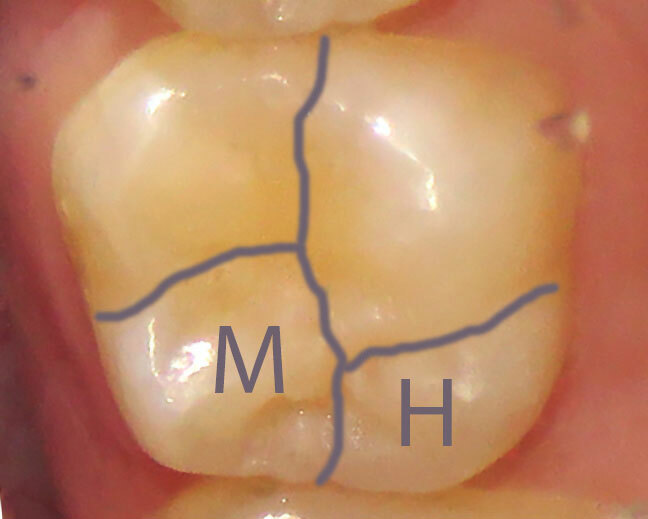 The squarish crown outline of the modern molar on the left contrasts significantly with the exceedingly skewed one of GhD/1 on the right. The cusp proportions are also significantly different, with the Hypocone (H) assuming a much larger size in GhD/1, as compared with the Metacone (M). At the University of Washington, Professor Aida Gomez-Robles has followed up on the work of Bailey and made valuable additional contributions in the field. Her main input that is particularly relevant to the Maltese taurodonts concerns which of the molars is the best diagnostic indicator of Neanderthal Man – the first upper molar! 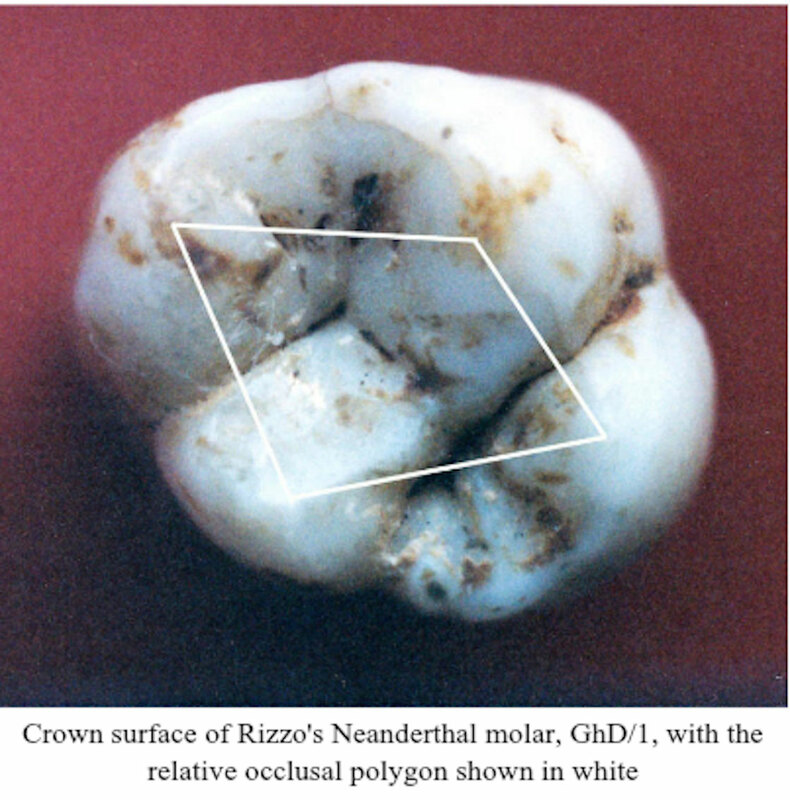 Rizzo’s molar, GhD/1 is a right first upper molar. After a detailed study of photographic images dating back to 1995, the present author managed to identify all the diagnostic features for a Neanderthal diagnosis on Gh D/1. The experts themselves in biological anthropology then confirmed these findings. Professor Chris Stringer was consulted about this Neanderthal presence in Malta, and on its equivalent latitude in Gorham’s Cave in Gibraltar, where he had been excavating when we first met. Initially sceptical about this Neanderthal presence in Malta, Stringer asked his colleague Tim Compton to have a look at the casts kept at the NHML. 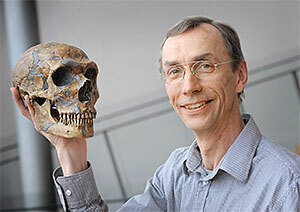 After getting positive feedback from Compton, Stringer persuaded the present author to have the three taurodonts tested for aDNA, and arrangements were made with Svante Paabo (below, holding a replica of a Neanderthal skull), a Swedish biologist who has worked extensively on the Neanderthal genome. He contacted me through Stringer early in May this year to persuade me to take the investigation of the Ghar Dalam molars further and have them undergo aDNA analysis – that is, if the required permits were issued from Malta. The question he is proposing to answer is the following – were our Palaeolithic Maltese ancestors ‘pedigree’ Neanderthals who survived into the Late Palaeolithic, like those at Gorham’s cave in Gibraltar; or had the genes of our Palaeolithic forefathers been admixed with those of Neanderthals through crossbreeding? Paabo also mentioned my involvement in the project from its earliest stages and that he would be working and publishing in collaboration with me, as well as with others involved in the study. The best possible chances of sampling the taurodonts’ aDNA were being offered to the Maltese people by the Max Planck Institute, where the probability of success is the highest at the present time. The analysis is also being offered free of charge, in the interests of science and Malta’s prehistoric past. Through aDNA analysis, the Ghar Dalam taurodont molars can still provide us with a great deal of more information, particularly on Neanderthal inter-breeding with modern humans. If successful, it can be conjectured from their micro-anatomical features that both GhD/1 and GhD/2 will reveal a hybrid of Neanderthal and anatomically modern human genes, a ratio that will be higher for Neanderthal genes in GhD/1 than in GhD/2. This is not merely a Maltese prehistoric issue, but a more generalised one that involves other regions that are today cut off from the Maltese Islands, now that a warmer climate has raised sea levels sufficiently to make this happen. The offer from the Max Planck Institute was too good to be refused. But it was. There were dwarf elephants and deer in the NHML project, but no human aDNA work was involved. Rather than have me involved in such an important project, Heritage Malta is depriving the Maltese people of having the molars tested at the centre with the best chances of success, and submitting them instead to the same process that failed on their dwarf elephant and dwarf deer. The taking of this serious risk of another failure is totally unwarranted for it would spell disaster if it does fail. This is no conspiracy theory; these are the bare facts that are borne out by documentation. Firstly, get Paabo out of the way. A letter was sent by Heritage Malta to Svante Paabo on the 27th May with the information that the 1917 molars were already in the USA, at the University of Georgia in Athens, undergoing aDNA analysis, radiocarbon dating, Isotope Analysis and Geometric Morphometric analysis through 3D scanning. There was no reason why Paabo would not believe this, but just in case he checked it out, a copy of the letter was sent to the Curator of the taurodonts in Mdina, John J. Borg. In reality, the taurodonts never left Malta; they are still in Mdina, in Mr Borg’s office, inside his safe. Secondly, on the 30th May, John J. Borg communicated with his North American colleague, Dr Suzan Pilaar Birch, at the University of Georgia, in order to acquaint her with the evolving circumstances and what Paabo had been told. Borg and Birch had been working together at Ghar Dalam on a project involving dwarf elephant and dwarf deer, and the University of Georgia had attempted aDNA analysis on the elephant and deer samples from Ghar Dalam, though with no success. Thirdly, Birch checked me out on what I had stated about the Ghar Dalam molars in Dossier Malta – on the 30th May she read the relevant 14 pages of the book that is uploaded on academia.edu. Fourthly, Borg and Birch were also collaborating with a palaeo-biologist, Victoria Herridge from the Natural History Museum of London. Herridge had come over in January to Ghar Dalam with her 4-month baby and worked there till the end of the month. The project was over on 31st January 2016, there was a farewell dinner, and everybody had gone back home. Herridge was still on maternity leave in January 2016 and she was obliged to utilise her ten KIT (keeping in touch) days in order to be allowed to work. She is still on maternity leave at the moment (August) and her ten KIT days have not been exhausted yet. On the first of June 2016, Herridge had a meeting with Stringer at the NHML, and it is evident that Borg had not yet updated her as he had done with Birch, for when Stringer contacted Paabo and me a few days later, he informed us that he was in contact with the Ghar Dalam team (i.e. Herridge) who had informed him that the Ghar Dalam aDNA had failed and that there was no work planned on human remains. Fifthly, on the 14th and 15th of June this year, Herridge and Borg discussed the details of their new project on the Ghar Dalam molars at length. Borg and Herridge were to lead the ‘investigation’, and one pre-requisite was that I was to be totally excluded from any part of it. They furthermore obliged Stringer to transmit this message to me, which he did, in a manner that compelled me to comply and stand aside for the time being while Borg and Herridge organized their aDNA analysis. The Leverhulme Trust had sponsored the dwarf elephant and dwarf deer project; it has since been alerted to the present situation in an effort to prevent their funds being utilised to sponsor this unorthodox takeover project that breaches all the codes of scientific and ethical behaviour in the academic world. Eight years ago, Borg was liaising with others on another aDNA project, on an ancient Egyptian mummy. The mummy had been stored at the NMNH for over a century, a gift of the British Governor of Malta, Lord Grenfell. Late in 2007 it was pointed out as an interesting item for exhibition to the Senior Curator, J. J. Borg by the local Egyptology Society, who also offered its assistance for its identification. I was vice-president of the society, and they refused the offer. They knew better, and, after a century of inaction, they started carrying out investigations on their own steam. 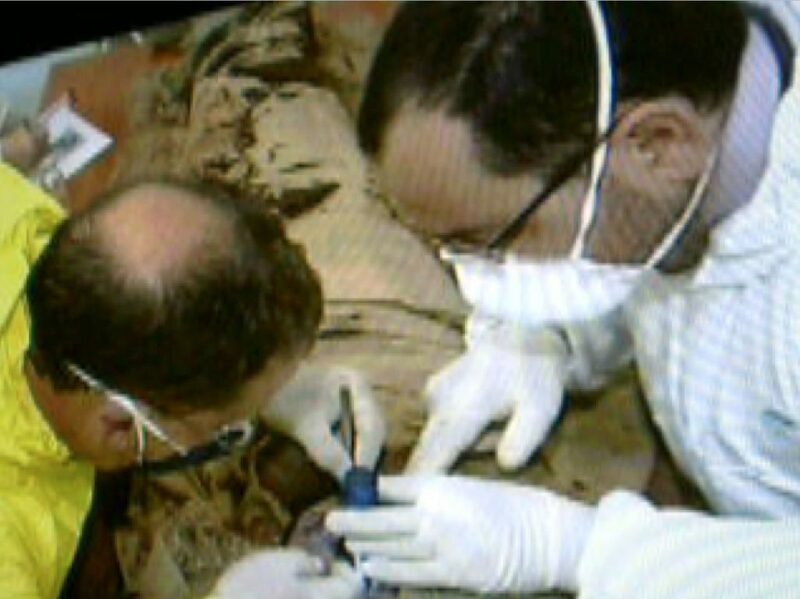 J. J. Borg on the right, sampling the mummy for aDNA, together with forensic pathologist, J. Abela Medici. The wearing of caps should be a standard procedure. However, at one point John J. Borg terminated the Society’s access to the mummy, as he ‘hatched an idea’ in April 2008 to investigate the mummy himself, with CT scanning, aDNA analysis and Radiocarbon dating. According to John J. Borg, the conclusions reached by the Egyptology Society of Malta were wrong for “the(ir) results indicate that the mummy was a woman aged between 25 and 35 years when she died … the findings of the DNA and radiocarbon dating tests will help us trace the provenance of the mummy to see whether she was related to the royal family in Egypt”. (http://www.timesofmalta.com/articles/view/20080428/local/the-mummy-with-a-story-to-tell.205931) (Times of Malta, 28 April 2008). There the matter rested, until it was discovered accidentally in 2014 that an MRI of the mummy had been taken in 2012 but remained unpublished. 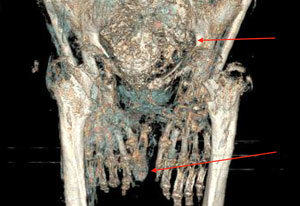 A look at the scans showed a male android pelvis and the male genital organ in situ (arrowed). The results of this MRI scan were never published. Is there any need for concern? Can we rely on Heritage Malta to keep the Maltese public, and other interested individuals, informed about our national heritage? Anati, E., 1989. Arte Parietale a Malta – Relazione Preliminare, Malta Museum of Archaeology Library, DAG.16.100a. (Box No. 6f ) TS (86). 22: 1-21. Anati, E., 1990. Arte parietale a Malta (Relazione preliminare), in Bollettino del Centro Camuno di Studi Preistorici, 25-26: 166-172. Baldacchino, J. G., & Evans, J. D., 1954. Prehistoric Tombs near Zebbug. Papers of the British School at Rome. 22: 1-21. Bailey, S., 2002. Neandertal Dental Morphology: Implications for Modern Human Origins. Doctoral Dissertation. Arizona State University. Bailey, S., 2004. 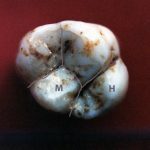 A Morphometric Analysis of Maxillary Molar Crowns of Middle-Late Pleistocene Hominins, Journal of Human Evolution 2004 Sept: 47 (3): 183-198. Bailey, S., 2006. Beyond Shovel-shaped Incisors: Neandertal Dental Morphology in a Comparative Context. Periodicum Biologicum, 108 (3): 253-267. Bernabo Brea, L., 1957. Sicily before the Greeks, Thames & Hudson, London; 1958. La Sicilia prima dei Greci. Il Saggiatore, Milan. Bone Analyses, The Palaeontology Department, Museum of Natural History, London. Caton Thompson, G., 1925. Ghar Dalam, in Murray, M.A. (ed.) Excavations in Malta, Part II, 1-18. Bernard Quaritch, London. Cooke, J. H., 1893. 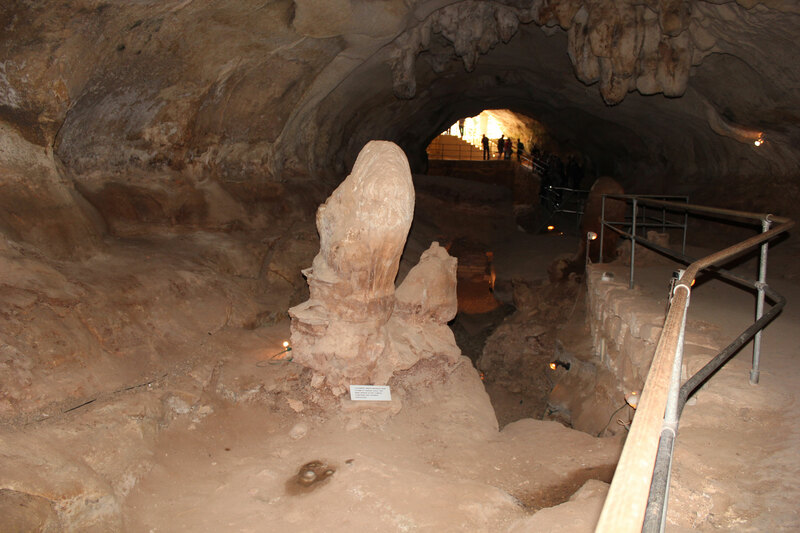 The Har Dalam Cavern, Malta and its Fossiliferous Contents. Proceedings of the Royal Society of London (Vol 54) pp. 274-283. Cosmopoulos, M. B., 1991. Exchange Networks in Prehistory, in Aegeum 7: 155-168. Despott, G., 1918. Excavations at Ghar Dalam, Malta in the Summer of 1917, in Journal of the Royal Anthropological Institute, (Vol. 48) pp. 214-224. Evans, J. D., 1953. The Prehistoric Culture Sequence of the Maltese Archipelago. Proceedings of the Prehistoric Society, 19: 41-94. Evans, J. D., 1954. The Prehistory of Malta, in Malta Year Book. Evans, J. D., 1956, Doctoral Thesis, Ms 2924, University of Cambridge. Evans, J. D., 1971. The Prehistoric Antiquities of the Maltese Islands. Athlone Press. Gomez-Robles, A., 2007. A Geometric Morphometric Analysis of Hominin Upper First Molars. Journal of Evolution 53: 272-285. Gomez-Robles, A., 2016. Palaeoanthropology: What Teeth tell us. Nature, Feb. 2016. Hancock, G., 2002. Underworld, Crown. Issel, A., 1866, Note sur une Caverne a Ossements de l’Ile de Malte, in Materiaux pour l’Histoire de l’Homme, 2 (Sept. 1865-Aout 1866), pp. 242-6. Keith, A., Letter to Nature, July 25, 1918: 204. Keith, A., 1924. Neanderthal Man in Malta, in Journal of the Royal Anthropological Institute, (Vol. 56), pp. 251-260. Leith Adams, A., 1870, Notes of a Naturalist in the Nile Valley and Malta, Edmondston & Douglas, Edinburgh. Mangion, J. J. 1962, Two Cases of Taurodontism in Modern Human Jaws, in British Dental Journal, 113 (9): 309-312. Martinon-Torres, M. et al., 2013. Morphometric Analysis of Molars in a Middle Pleistocene Population shows a mosaic of ‘modern’ and Neanderthal People. J. of Anatomy, 223(4) 353-363. Mifsud, A. & Mifsud, S. 1997. Dossier Malta – Evidence for the Magdalenian. Proprint, Malta. Mifsud, A. & Savona-Ventura, C. (eds), 1999, Facets of Maltese Prehistory. The Prehistoric Society of Malta. Paabo, S., 2014, Neanderthal Man: In Search of Lost Genomes. Basic Books. Renfrew, C., 1973, Before Civilization. Penguin Group, London. Renfrew, C. and Bahn, P., 2004, Archaeology. Thames and Hudson Ltd, London. Samut Tagliaferro, J., 2000. Malta – its Archaeology and History. Casa Editrice Plurigraf. Shackley, M., 1980, Neanderthal Man. Gerald Duckworth & Co. Ltd. London. Spindler, K., 1995. The Man in the Ice. Phoenix, London. Superintendence of Cultural Heritage, Foreign Correspondence May-June 2016. Ugolini, L. M., 1934, Malta – Origini della Civilta Mediterranea. Rome. Zammit, T., 1917, Archaeology Field Notes, Manuscript 18. The Library of the National Museum of Archaeology, Valletta. Zammit, T., 1930. The Prehistoric Remains of the Maltese Islands. Antiquity March 1930.